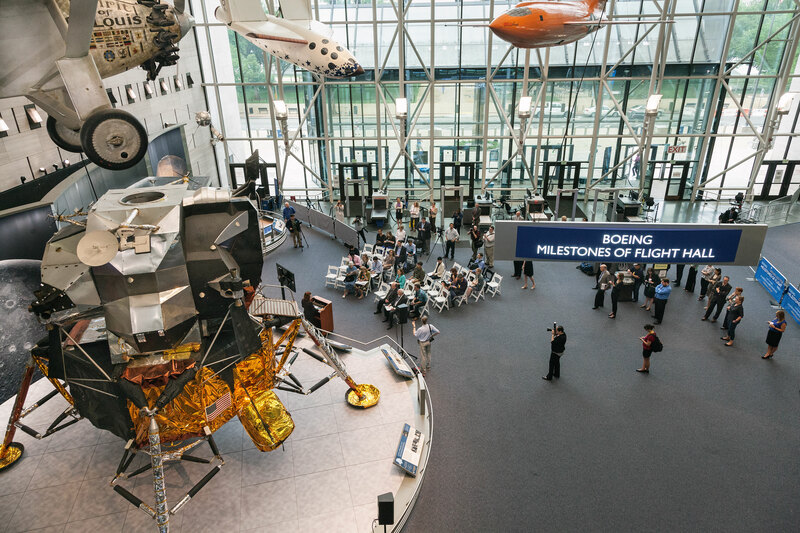 Visit us in Washington, DC and Chantilly, VA to explore hundreds of the world’s most significant objects in aviation and space history. Learn how aviation and spaceflight transformed the world. The lunar module represents one of humanity’s greatest achievements: landing people on another heavenly body. Don’t miss our fast-paced webcasts designed to engage students in Science, Technology, Engineering, and Math in 30 minutes. Apollo 11 was a global event. What did that historic mission mean to you? Share your story and read what others have to say. Our scientists are involved in current research focused on the Martian climate and geology. Find out what we’re discovering. Recognize your favorite air or space enthusiast. Add his or her name to the Museum’s Wall of Honor. The LM-2 on display in the Boeing Milestones of Flight Hall during the press preview of the new exhibition. For print or commercial use please see permissions information. Thank you. You have successfully signed up for our newsletter. Sorry, there was a problem. Please ensure your details are valid and try again.